This post digs deeper into the MailChimp data which I analyzed in my previous post. In this analysis, I’ve focused on the distribution of subscribers and what was the most recent date they opened an email. 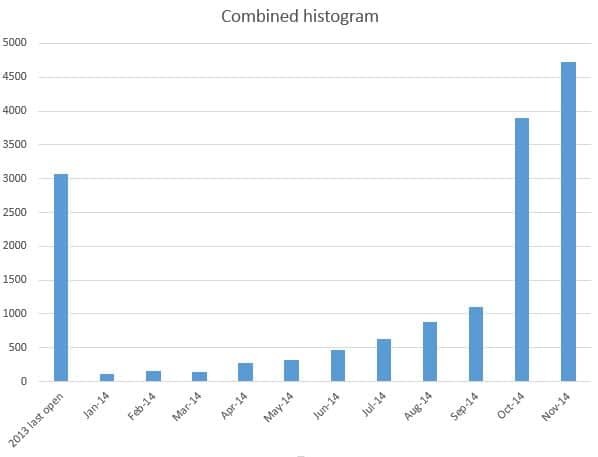 What is the distribution of subscribers by campaign date that opened an email in 2014? And what are their email addresses? The way I approached this problem was to break it down into its constituent parts, tackle each of those and then build that back up into a single query. This is the first cohort. Subscribers who haven’t opened an email in 2014 at all. This means they won’t be in the campaign data table, so the query to identify this cohort is straightforward. First, I used a sub-query to identify those who are in the campaign data table. Then, in the outer query, I selected all subscribers who were not in the sub-query table. Running this query produces a list of email addresses for subscribers that are not not in the campaign data table. The output of this query is a single number, but it gives us a good starting point for the analysis of the campaign data. The result of this query is a list of email addresses and the most recent date that subscriber opened an email. The last line of the MySQL query orders the list by the date column, from oldest to newest, so the least active subscribers are at the top of the list. From Step 1 and Step 3 we have the two tables of email data that we are interested in. Now we can combine them into a single table using the UNION operator, which combines rows. It’s necessary to have the same columns of data in each table, hence why I added the 0 as last_open code in Step 1. Running this query results in a list of email addresses with the date of their most recently opened email in 2014, or, if they haven’t opened an email at all in 2014, a 0. First I looked at the campaign email for 2014 and determined the distribution there, grouped by date of the most recently opened campaign email. This is a count of how many people opened the email for each campaign, from the campaign data table. 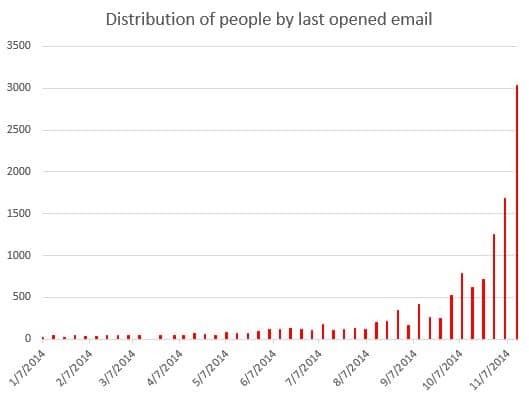 Unsurprisingly this shows many people on the list have opened the most recent campaign emails. 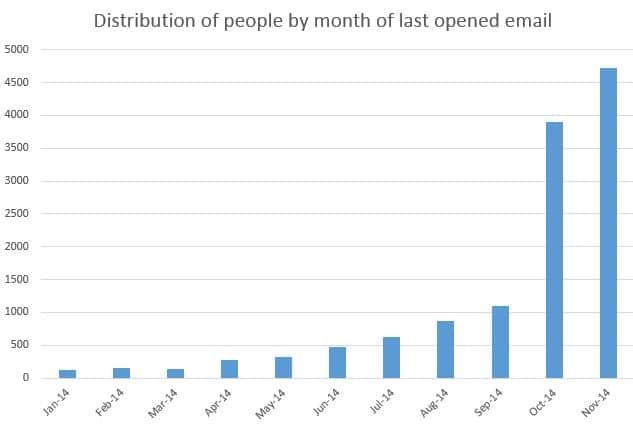 This is good, it shows there is a large and highly engaged group, whose most recent email open was this November. It’s still too granular however, so I grouped the campaign dates into months and then created a histogram showing the monthly distributions. and then grouping by cohort. This is definitely easier to read than the first chart. So we can see exactly where the problem lies. The roughly 3,000 emails on the list who haven’t opened an email this year need to be resolved, and either removed from the list or encouraged to engage with the brand again.Their email addresses were identified in steps 1 and 3 of this post. Any questions or thoughts on the analysis? Please leave a comment below.